I had 1 date fixed in my mind for the north island. Sunday the 17th of December, it was the only Wairoa release while we were up North. I had organised for a crew of mates to make the mission over and was keen to get on the river I'd heard quite a lot about. 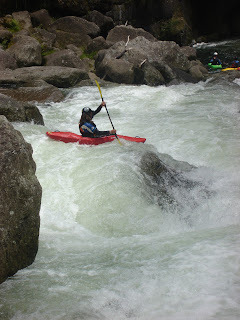 For the top section Shanan & Jimmy were our "guides" and Gordy and myself were new to the Wairoa. The action was short and quick through the entry rapids and we made our way downstream quite quickly. Time flyed and before I realised we were at Roller Coaster (site of the Wairoa Extreme Race) I got out for a look & grabbed the camera, Jimmy & Shanan went down to show us the lines but Gordy & I were both amused as they both went through the bottom of the rapid upside down. Then Sam Sutton & Coyo came through showing us some sweeter lines & then we were up. No carnage stories unfourtanetly and we continued down to the slalom course and met up with Megan & Tully who had walked up the track. 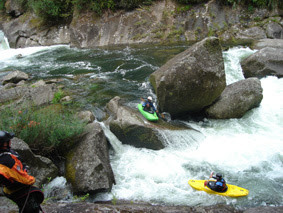 The last few rapids were short boulder gardens before the final 2m waterfall and paddle to the take out. Everyone had nice lines off the falls & we had break for lunch. After driving back to the put in we geared up for a 2nd run. 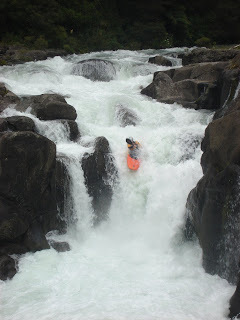 While getting ready we watched a nameless paddler (maybe Mark Robertson) run McLaren Falls. Then the 4 boys had another run down the river, we were joined at the bottom of Roller Coaster by Louise Urwin, who was making a solo mission down in her new rad 175. She ended up having a bit of fun in the back wash of the bottom waterfall. Good clean fun for the whole family. Shanan Miles run the Chicken Chute while Jimmy & Gordy watch on.